The goal of the present study was to establish the condition to obtain preparative amounts of the recombinant cytotoxin α-sarcin to be used for immunoconjugate production. α-Sarcin cDNA was isolated fromAspergillus giganteus strain MDH 18894 and its expression inEscherichia coli was attempted by the use of both two-cistron and fusion protein-expression systems. Whereas the former resulted in low intracellular expression level of recombinant α-sarcin (r-Sar), the latter allowed high-level expression of the fusion protein in the culture supernant. A variant form of α-sarcin with an additional threonine residue in position 1 (Thr-Sar) was obtained by proteolytic processing of the fusion protein with a final yield after purification of 40 mg/L of culture. 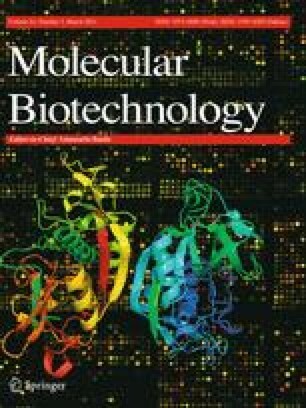 Both recombinant proteins r-Sar and Thr-Sar were identical to native a-sarcin with respect to the biochemical properties and to the in vitro biological activity.